Stop worrying! Nothing wrong here, just busy! Here's a taste of my Life Lately. Thursday I was melting butter in the microwave and it started sparking inside. Well that's not normal! Then I put in potatoes to 'bake' and holy smokes, did it really start sparking then! I looked inside and guess what -- FIRE! Just a tiny little flame on the side where the light is but that's definitely NOT a good thing. I hollered for Andy who came running, grabbed the thing and hauled it outside to the deck. Boy did it stink! We had a good laugh. And on Friday I ran to town to get a new microwave. The one that died was a graduation gift to me from all of my aunts and uncles on my mom's side, so that's a 16 year old machine there! I used it all of those years but the 5 we were at our old house, because it had an over the stove one. I've been secretly waiting for it to die so I could get an over the stove one here but we decided to just get another counter one so we didn't have to mess with removing the cabinet that is currently there. And we have a little 'cubby' where the microwave sits so it's not taking up any counter space. P.S. I like the new one! 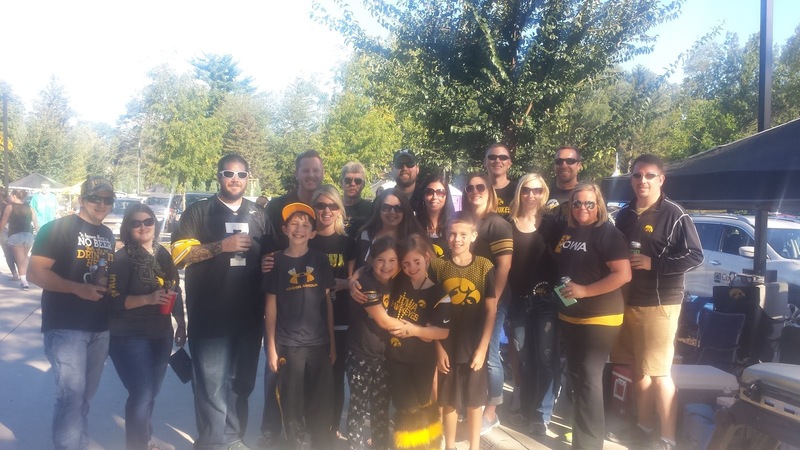 Saturday we left the boys with my parents and went to the Iowa game. It was out annual FFBF game - Friendly Friends Being Friendly. That title was coined by a friend and has stuck ever since. This was, I think, our 6th annual game together. This year we had 7 1/2 couples there, tons of food and a lot of fun! Then the game. Holy smokes, you guys, it was the most emotional game I've ever witnessed! One of Iowa's greats, Brett Greenwood, was the honorary captain. Doesn't sound like a big deal but guys, he's around my age (30's) and had a stroke a few years ago. He barely walks with a walker and help. So, there he is, standing on the edge of the 10 yard line waiting for the team to come out of the tunnel in their "Swarm" formation. Normally they come running out to the song 'Back in Black', but this time they come walking out, grab hands and walk up behind Brett. Then Brett starts walking with assistance and his walker and the team just walks out onto the field behind him. I mean, TEARS RUNNING down my cheeks! It was so dang powerful! You HAVE to watch it. Click on this LINK HERE to see it. It's not the best quality video but it's the one that shows so much more and you can hear the music which makes it more awesome, so that's why I chose this one. Please watch it! So powerful, so emotional! That was just one part of the game that had me crying. The Kid Captain, a 5 year cancer survivor out in the middle of that big ol' field with 70,000 fans cheering, just standing there waving and smiling! Gah! My heart! Then the Game Hero, a military vet, probably in his 30's or 40's, sitting in a wheelchair out on the field being honored. More crying. And Robert Galloway, another past player, winning the ANF (America Needs Farmers) award. I was so proud to be there and be a part of that! Anyway, lots of crying on my part. Then we were tied 24-24 with less than 5 seconds to go and our guy, Marshall Koehn, kicks a record long field goal in Kinnick Stadium to win the game!!! No one left their seats for a solid 10 minutes! The celebration was beyond awesome!!! I jumped up and down 2 times, then about delivered the baby right there, so I had to just clap and yell and scream and cheer! It was amazing! The best game I've ever been to, hands down! 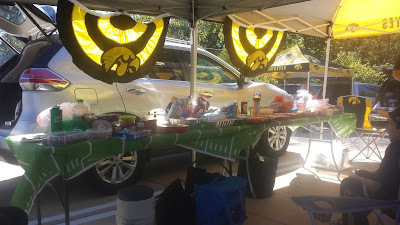 The Iowa Hawkeyes really know how to honor those who are deserving! We were on such a high from that game, couldn't stop talking about it Sunday. And Sunday, we did nothing. We were beat - the game started at 7, we didn't get out of the area and on the road until 11:30, so we were just beat. We had plans but didn't do any of them. Andy did go scouting for deer in the morning, but otherwise the lawn didn't get mowed, the baby's room didn't get painted, I didn't go to a cousin's baby shower. We took over an hour long nap and woke up feeling like crud after. I hate long naps - they don't refresh me, at all. I did take Aiden to his very first 4H meeting that evening! We had fun, it totally brought back memories from my days in 4H. We came home, watched football and went to bed. Lazy lazy lazy day. Monday we got Princess's room painted!!! I got it all trimmed while Tate napped then Andy rolled on two coats of paint after work. It's PINK. The color was called Barely Pink, but it's not as 'barely' as I thought it would be. But I think I'll love it once it is all decorated and put together. Today I ran to the big city to have stitches removed (more on that in a second), so Tate and I ran all over the city running errands that I've needed to get done and just kept putting off. Baby Girl's room got a few more items for decorating it, plus curtains. I also bought fabric to make her a special blanket. My mom is making her one, too, but I just couldn't resist making her one from me. You know I'll show it to you when it's done! We also got shelves and clothes hanging poles and brackets to finish off the boys' closets so we can move their clothes downstairs and out of Baby Sissy's closet and dresser. Today was a productive day for sure! I heard so many people talk about how amazing the Iowa game was this past weekend. So cool that they did such a spectacular job honoring such deserving people. And, how great that you were there to witness it all! I cannot wait to see Princess's room! It's going to be fabulous. With all the years I spent in the sun at the pool, and then years of life guarding , I really should have a full body check. I cannot wait to see baby girl's room!! I know you have been planning this room for some time!!!! That game sounds amazing. I'm such a crier. I would have been an emotional wreck too I'm sure!